Nearly every small town, borough or city across the world has an area where rumors of unexplained happenings are commonplace. Some people choose to pass these stories off as balderdash, while others are drawn into the wonder of the unknown. I certainly fall into the latter of those two groups, which is why I recently took in another tour with the Fox Valley Ghost Hunters. 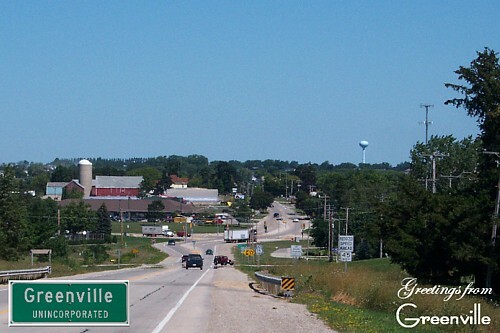 This trip was centered around the Greenville Station in Greenville, Wisconsin. The Greenville Station was first built in 1887 to serve as a saloon. A fire ravaged that building, causing it to be rebuilt as a hotel in 1897. It also served as the railroad ticket office at that time. The building was bought and sold many times over the years and used as a barbershop, bus station, funeral parlor, and a fire dispatch station. It seems the saloon and hotel aspects were almost always a part of whatever other business sprung up from under the two-story building’s roof. Word around town is that the place even served as a brothel for a time. The ownership switches may affect who has the keys to the front door, but it seems that a number of spirits have claimed the inner domain for themselves. Waiters who worked there dreaded going down to the basement for supplies, as an unseen force enjoyed tormenting them. The spirit had a habit of yanking their hair, brushing up against them, making their flesh feel as if it had been struck, and on one occasion even knocked off a pair of glasses from an employee’s face. The workers reported activity in other areas of the building as well, with crashing noises and something that sounded like an item being dragged across the floor being two of the more common oddities. Previous visits from the ghost hunters and guests have netted several incidents of people having their hair pulled. A voice was heard in what is now the woman’s bathroom (formerly the barbershop) that said, “Watch the children.” Another incident had a woman being pushed by unseen forces while surrounded by others in the kitchen. One of the female ghost investigators was hit in the face by an nonexistent fist, which resulted in a bruise forming. The room that happened to serve as the viewing area for the deceased during the period the building was used as a funeral parlor now has a piano stationed in it, the piano can be heard playing when no one is in the room at certain moments. An attic door, which was supposedly part of the brothel originally, had a habit of opening itself up when no one was around. It has now been sealed up firmly. The story goes that a prostitute named “Loretta” fell from the second story of the building and died, so it is thought that she is the spirit who is occupying that area. Part of the remodeling over the years saw a stairway walled off. This has left a door near the bar that opens up to a flight of stairs that goes nowhere. The ghost hunters tapped on that door one evening and received a knock in return. Our evening began at 8 p.m. The daylight had subsided and once we extinguished the bar lights, it was only the glow from the street lamps that illuminated our surroundings. It became obvious quickly that the noises from the road, as well as a nearby fireworks presentation would hamper some of the ambience of the dark. Our assemblage included 8-10 females, myself and a male friend, and a trio of ghost hunters. The ghost hunters set up a rem pod to detect movement and they began to try and convince the spooks to visit us. The rem pod failed to indicate we had any extra guests with us, but we did hear several light taps coming from the ceiling above us. We next headed upstairs to another bar/dance hall area. It was here that the investigators decided to try a spirit box, a device that taps into radio waves which allegedly allows the deceased to speak to the living. They tried to make contact for around fifteen minutes. The ghost hunter manning the device seemed to hear more clear answers than what I was able to pick up. At one point though, they did ask the ghost to say a number and the box transmitted out a loud and clear “seven” with nary a moment having passed. That was a true tingle inducing moment for me. As we were leaving that area, the lead investigator asked us all to come together for a group photo for the team’s social media pages. For whatever reason, this sparked the spirits, and the rem pod went off wildly as it sat alone in the doorway 50 or more feet away from us. The third and final leg of our tour was a trip to the infamous basement. The walls there are made of solid rock, with a low hanging ceiling that forced most of us to crouch in order to move without hurting our heads. There were no lights on in the basement, and had one wanted to see their hand in front of their face, it would have been impossible. We all had little flashlights with us in order to navigate. The investigators told us that the end of the dark hallway was a popular spot for noises and lights, so I volunteered to encroach upon that spot. While I sat in the darkness, I heard the others setting up the rem pod and it almost immediately started going off. Some of the ladies in the group reported they felt a touch, and a cold chill. When the investigators moved the rem pod to the stairs, the activity ceased. A bit later I moved to be with the group, placing myself in the spot where the crematorium had once laid. I was hoping it might still be down there, in at least the form of a rusty shell, but instead the area merely contained wooden shelving. We did not experience any sort of extraordinary moments doing this. We did hear two to four distinct banging sounds coming from above us, and when a investigator was dispatched to look into it, he couldn’t find an explanation for what we had heard. We ended our adventure a little more than an hour after it began. The lead investigator apologized for the spirits not providing a better show for us. He implored us to verbally state on the way out that we didn’t wish to be followed, as the spirits have been known to occasionally cling on to people and began pestering them at home. I chose the opposite route and asked them to come along.